I replied immediately and booked myself in knowing how popular these evenings are. I was really looking forward to this! Having arrived on my own I wasn’t really too sure where to sit but was quickly reassured by our host that it was a mash-mash of people with the idea being to mingle with like-minded people who enjoy good food and good wine! Tables were laid out as one long table, banquet-style, along the length of the room with chairs placed on either side of the table (it’s an intimate venue.) Wine glasses stood proudly along the table accompanied by water jugs. Apparently so as to rinse out your wine glass before trying the next wine. As people arrived and took their places at the banqueting table it was evident that this was not to be one of those pretentious evenings where people talk about the bouquet of the wine whilst spitting half of it out into a bucket! 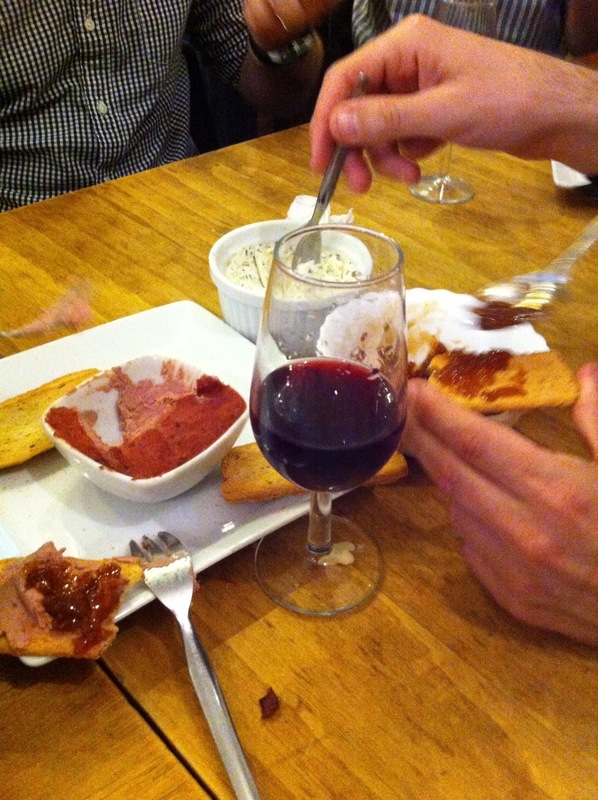 This was simple – 6 wines, 6 tapas, enjoy yourselves! It did exactly what it said on the tin. All three components of this course were very well balanced. The wine was chilled but not cold. It had a delicate herbal note that was reminiscent of recently mown grass which was very well matched to the thyme in the sauce in which the moules were bathing. This sauce was flavoursome yet light. 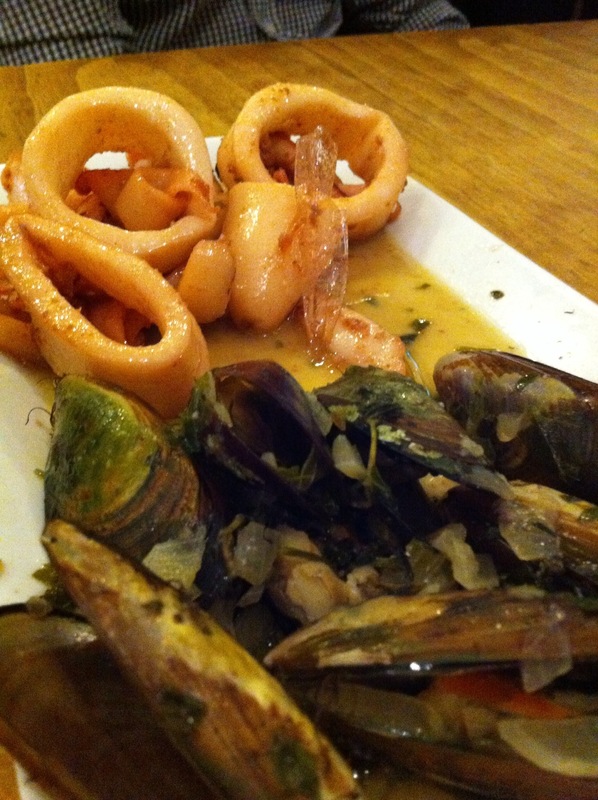 The calamares – something which can sometimes become tough and rubbery through over cooking, were tender and exquisite on the tongue. My only complaint was that there was no bread at the table to mop up the herby, garlicy juices that remained at the bottom of the dish. But my panic was immediately abated by the waiting staff as they swiftly came round leaving bowls of rustic, chunky, Spanish bread for everyone to get their fill of the juices. De-licious. Not generally a fan of pink wines (probably because I drank copious amounts of Mateus Rosé in my youth!) I was slightly hesitant about trying this wine. However after my first sip I was in danger! This wine was so quaffable; I couldn’t get enough of it. I could imagine myself sitting in the sun guzzling glass upon glass of this wine. It had a robustness and lingering finish that I would never have associated with a Rosé. The birds nests were prepared with brie and lardons (to stay in the french vein). I thought this combination might not work with the wine, as the saltiness of the lardons would interfere with the floral notes in the wine. A vegetarian at our table had her own lardon-free nests. For research purposes I tried both with the wine and surprisingly, the lardons made the wine taste sweeter and almost intensified its flavour and finish on the pallet. With the white and rosé unscrewed and consumed we moved onto the reds. Two Bouchard Burgundy Reds were on the menu – Fleurie and Morgon harvested from different villages within the Beaujolais region. Chicken liver pâté with caramelised onion chutney was beautiful. I must confess I do have a weakness for any pâté on crispbread but the star here was the goat’s cheese, with its mix of herbs which gave the dish a shimmer of sophistication. This was matched with the Bouchard Fleurie. This wine was deceptive. It had a slightly shocking pink hue to it but was still full bodied. The creamy goats cheese and the velvety mouth-feel of the wine were in great partnership but I was intrigued to see if the white wine we tried at the beginning would have been as good a partner to the goat’s cheese pâté as the Fleurie? Food for thought (pardon the pun!). Classic Coq au Vin deconstructed and presented en brochette. The chicken itself had been marinaded in the Bouchard Morgon overnight. And you could taste it. The eternal worry with cooking chicken is always presenting it underdone and even worse nuking it within an inch of its life. Our host apologised for the length of time we had to wait for this to finish cooking but to be honest we had been plied with so much wine by now that it really wasn’t a worry! Everyone was mingling and chatting away as if we all knew eachother previously. 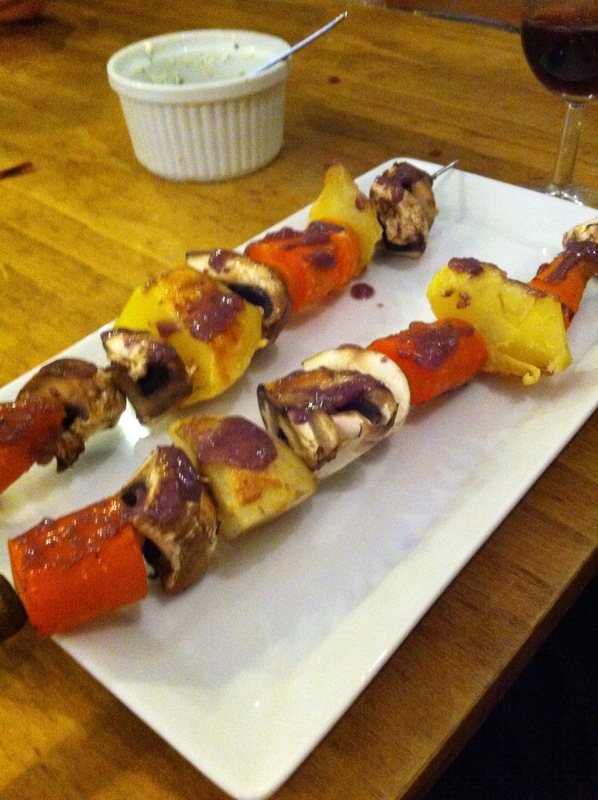 As instructed by our host, we removed the pieces of the brochette onto the plates provided. The chicken was succulent and tender. The marinade had been reduced to make a sauce to go over the chicken. This was packed full of flavour and finished the dish off perfectly. I was very impressed by this take on a classic dish. The megastar of the evening in both the wine and food was the matching of La Fiole Du Pape with Boeuf Bourguignon. La Fiole is surprisingly soft on the palate but its strong tannins lead to a powerful almost majestic finish. It is full bodied but silky and smooth at the same time. The boeuf bourguignon was melt-in-your-mouth tender! The intense red wine flavour coming through with every mouthful. I must mention the dumplings; these were a clever addition to this dish as more bread to clean the plate with, at this time of the proceedings, would have literally been gut busting! Fair enough – Moscatel is NOT a French wine! I know. We all know. Unfortunately we were meant to try a French variety of this wine but alas it was not possible. According to the professionals though, the only difference between this white and the French version was the label and hence the price. So close your eyes and imagine a profiterole in your mind. Erase the chocolate coating on top. Now remove the cream that’s inside. Sprinkle some coarse/pearl sugar over, and presto you have a choquette. 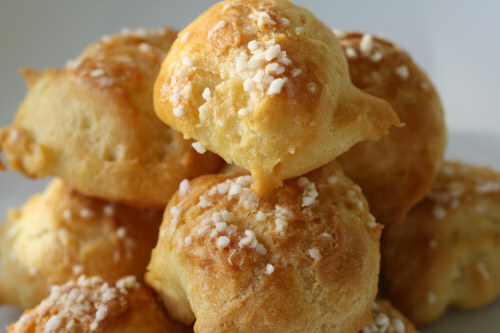 Parisians would have these in the afternoon as their le snack with a cup of coffee. However, being neither Parisian nor the afternoon we were jovially chomping our way through these sweat treats drinking copious amounts of sweat white wine. My tip: dunk these in the sweet wine. Not only did it serve to help restore some moisture to these cream puffs but they symbiotically sweetened eachother creating a tantalising dessert that relinquished their secret juices with every bite. It had me going back for more! A perfect end to what was a truly a enjoyable experience. Next time, barring epidemics and natural disasters, I shall also go on my own, unfazed by the prospect of being alone, knowing that from the minute I get there I will be in the presence of good food, good wine, and good company.